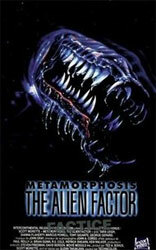 “Metamorphosis: The Alien Factor” is a lengthy titled semi-sequel to the cult favorite, “The Deadly Spawn” (1983). Glenn Takakjian has crafted a loving, if you can call a gory slime-fest, ‘loving’ ode to the dying days of latex and Karo syrup monster movies before they gave way to mostly tedious computer generated creations. It’s a small film that tries to go big and falls short, but does with so much enthusiasm, that it still manages to be a very satisfying experience. “Metamorphosis: The Alien Factor”, probably couldn’t open in a more stereotypical way: A security guard in what looks like the building where you drop off your cable bill, except way more evil, responds to an emergency in a lab and promptly gets himself eaten. The next day his daughters, curious why their dad never came home that night, head to his place of work, the TALOS Corporation. Several flashbacks and flashbacks within flashbacks later we come to discover that the TALOS Corporation was given a sample of alien DNA to study and one of their own scientists became infected with it. It’s slowly turning him in a huge monster that can shoot deadly spores and lash out tentacles to grab victims and naturally the head of TALOS isn’t interested in letting word of the lab accident or any survivors out of the building. Pretty obviously cribbing from, “The Thing” (1982), “Alien” (1979) and sprinkling in a little “Evil Dead II” (1987), Metamorphosis manages to showcase all manner of special effects: make-up effects, puppetry, and even some miniatures with stop-motion. It’s a film were these things come before story or pacing. Although none of it is ever entirely convincing, you don’t mind because it’s all made with such care and shot by a director who seems to really enjoy rubbing the viewer’s face in all manner of slimy monsters. The acting isn’t the best but it never gets in the way of the story. Fortunately, two of the best characters get a bit more screen time than you think they would; the evil head of TALOS, Dr. Viallini (Marcus Powell) who chews up every scene he is in with an arch fish lipped delivery and an unidentifiable accent. Mitchell (Tony Gigante) is one of Viallini’s armed thugs who proves to be both more and less heroic than he first appears. The rest of the small cast do a serviceable enough job and both Tara Leigh and Dianna Flaherty as the Griffen sisters do sell the monster attacks quite well. I ended up liking this movie a little more than, “Deadly Spawn.” The effects are more accomplished, the story a little tighter while retaining just the slightest mean streak for all the potential victims. Once the movie gets through with its incessant flashbacks and settles in to people fighting monsters, it keeps amplifying the threat and the set pieces in wonderful and unexpected ways. I even love the way the final scene in the film echoes the final moment of “Deadly Spawn”. A great low budget monster movie, well worth the time to watch.